From "Never Say Never" To "Better Late Than Never"
I had big plans to post about the Justin Bieber movie (“Never Say Never”) first thing this morning, but things got busy, and then I had to leave the house, and you know the rest. I still want to get it in under the wire before midnight, since I said I’d do it TODAY, and so I’m in a “better late than never” situation. I’m sure most of you have been on the edge of your seats all day, just waiting for me to click “publish”. Right? So without further ado, let me share with you my Bieb-sperience. I even sent my sister a Twitter DM on Sunday, asking if she’d want to go. I thought for sure (seriously!) she’d meet me there. You may not know this about my sister, but she has seen nearly every movie ever made, in any genre (with the exception of horror flicks: I don’t think those are her “thing”). She will watch big-budget movies, foreign films, documentaries, indie films, art house movies, musicals, and animated shorts. I didn’t anticipate ever finding a movie she just wouldn’t want to see. Apparently the line she won’t cross is Justin Bieber. Go fig. It was dark when I had to walk back to my dorm. I walked quickly. That movie was intense, and the thought of not getting back safely weighed heavily on my mind. Luckily, I was fine. Lesson learned: I don’t see intense movies by myself anymore. But I really wanted to see the movie, so I pressed on. The good news is, I’m not alone in the theater, like @houseofjules speculated I might be. There are two mom-looking people a few rows up, no kids with them. Other than them, everyone seems to have brought an under-13 accessory. Shh…it’s starting! Let the inspiration begin! OMG, someone google how old Justin Bieber’s mom is for me: she’s so young! Bieber fan: “Once? I tweeted him 100x in a day!” No worries, kid. If I had Twitter in the 80s, Duran Duran would’ve had me arrested. Amazing that hardly anybody knew who Justin Bieber was only TWO YEARS AGO. Jaden Smith’s billing: “Karate Expert”. Interesting choice. Miley looks like an amazon next to Justin. Gotta say, that Jaden Smith has great stage presence. I think this is the final concert scene. WHERE’S MY GLOWSTICK??? Crying. There, I said it. Intense admiration for Justin Bieber’s team, for looking out for that kid like family. Wow. All in all? 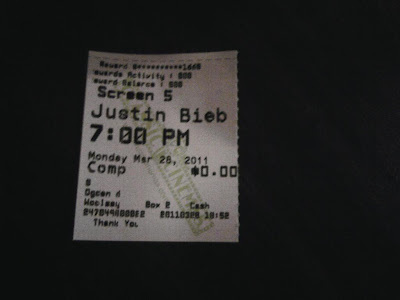 It was a really good movie. I didn’t walk out of there feeling like I needed to buy all of his music: I still like the songs that I already liked and not really too much more than that. But the movie delivered on what I had heard before: it was an inspirational story of a kid who worked really, really hard to achieve a certain level of success. 1. Technology is great. The use of Youtube and Twitter as building blocks in Justin Bieber’s career is a a pretty amazing thing. I found myself wondering if he ever would’ve been discovered and given a chance, had it not been for those two websites. 2. Though it was bizarre to sit in a dark theater, as an adult, watching a movie full of screaming teenaged girls, I could relate in that it took me back to my own teenaged years when I was head over heels in love with Duran Duran, Adam Ant, and–OMG–John Crawford from Berlin. I’m a little jealous that the teens of today have it so easy and can watch videos over and over again on the internet. Back in the day, I had to sit in front of MTV (when they still played music) for hours just to catch the videos I wanted to see. 3. Most impressive to me about the Justin Bieber story (besides the fact that nobody knew who he was two years ago) is the group of people who surround him. They all play a familial role for him (his mom tours with him, too): he’s got “brothers”, “uncles” “second moms”, “sisters”, and more, all truth tellers rather than “yes-men”. They all genuinely seem to be interested in helping Justin walk the fine line between hanging onto some semblance of youth while navigating the peaks and valleys of pop stardom. I walked out of the theater saying a silent prayer that those closest to him can keep him grounded enough so that he doesn’t fall off the right path on his way to adulthood. If they are–and he is–successful, I think he just might be around for a while. The movie reinforced to me that surrounding yourself with people who look out for you and lift you up rather than bring you down is one of the keys to success. I already subscribe to that theory. I wouldn’t trade my family and friends for anything. I would have gone with you…just sayin. For a young person, really any one, having a support system is vital. Having one that protects you from yourself is rare. Good for Beiber. 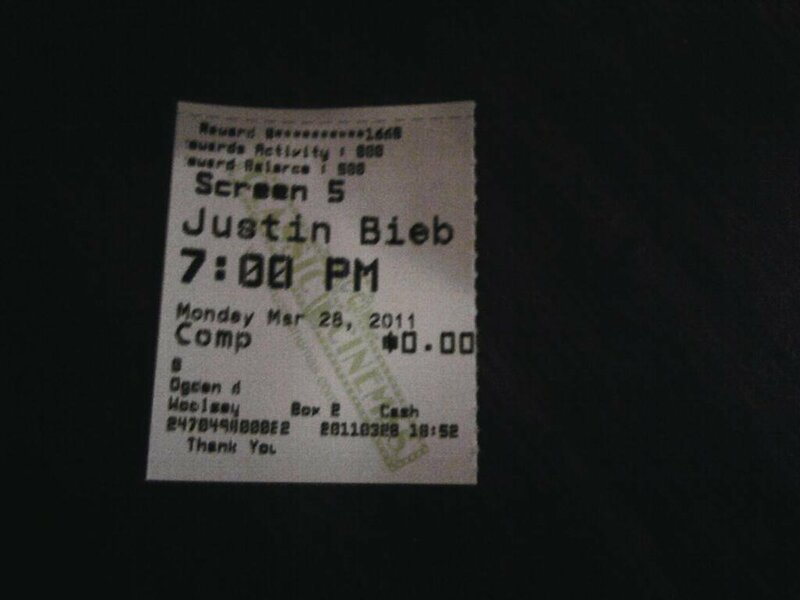 I still can't imagine myself seeing this movie. If I was there I would have gone. Did you see any grandparents? I like him also and I'm much older than you. Was Ellen in the movie? It is good to have a great family around you and me I don't know what I would do with out you and them. Previous post: To Bieb Or Not To Bieb, That Is The Question.